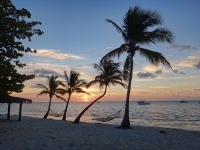 Little Cayman is the least developed of the Cayman Islands. With a resident population of less than 200, and measuring only 10 miles (16km) long and a mile (2km) wide, it still offers that rare combination of sun-blessed solitude, glistening beaches and miles of untouched tropical wilderness. Like the other Cayman Islands, Little Cayman is barely above sea level. Here, shy iguanas and rare birds outnumber humans. Famous dive spots on the northwestern coast, such as Jackson Point and Bloody Bay Wall, attract the most visitors to the island but Little Cayman is also great for bird watching. One of the world's largest nesting colonies of red-footed boobies are to be found among the mangroves in the Booby Pond Nature Reserve, which is also home to some gliding frigate birds. Rock iguanas abound and there is also a rare tree-climbing lizard hiding well camouflaged in the green and brown island vegetation. Other activities that can be organised on the island include kayaking trips and kite surfing.